Gluten-Free living is complicated, especially when you are listening to outdated, incorrect information. Over the seven years I’ve been writing about thriving gluten-free, I’ve found some pieces of celiac lore that just won’t die, even once completely disproven. For October Unprocessed, I want to bring them up and put them out to pasture, permanently. The reason so many of these urban legends continue to have life is because folks are searching for answers. They understand that they have to avoid wheat, rye, and barley but don’t know the other names for them. For example, barley malt is frequently just called “malt” on the labels. Dr. Google is a lousy diagnostician and historian. Everything on the web lives forever, so if you choose just the right search terms, you will pull information from long before the research was updated. I’ve gathered my list of proven, accurate sources for celiac and gluten-free living to share with you. When you have a question about an ingredient, search these sites first, then ASK these sites your question if you can’t find the answers. The folks who write these sites go back to the medical literature to find your answer, they don’t have financial ties to labs or drugs, they just want to help. 1. Maltodextrin doesn’t have malt; it is a sugar. Products made in other countries can have wheat-based maltodextrin and must be labeled as such. It is never made from barley or rye. 2. Modified Food Starch – If made from wheat has to be labeled as such; never made from barley or rye. 3. Caramel Color is made from Corn or Sucrose in USA and highly refined to remove gluten in Europe. 4. Shredded Cheese uses cellulose (wood starch), potato, or cornstarch, but not wheat starch. Yup, you are eating ground-up, highly processed trees when you use pre-shredded cheese. Grate your own to avoid this. 6. Envelope Glue – There’s no gluten in envelope glue, according to the international Envelope Manufacturers Association, no matter what a major Gluten-free brand claims. 9. Coffee is naturally gluten-free, but watch for flavorings. 10. Corn – All Corn is naturally gluten-free; watch for flavorings, seasonings and other additions. This list is of foods that newly diagnosed gluten-free folks typically forget have gluten, creating an exposure and reaction. 1. Soy Sauce – Most soy sauce contains wheat, which means any food made with soy sauce is gluten-full, including things like Barbecue and Teriyaki sauce. 2. Soups, Sauces, and Gravy – Most creamy gravies, soups, and sauces have wheat flour as a thickener. Any food made with a prepared soup as an ingredient is likely gluten-full. 3. Oatmeal – Naturally, oatmeal does not contain gluten. The growth rotation of farmers sometimes has oats following wheat in the fields and unless precautions are made, the oats travel in trucks that carry wheat, are processed in mills that also handle wheat, and get contaminated with gluten along the way. Look for certified gluten-free oats. 4. Beer – Barley is the reason beer is gluten-full. Some beers also contain wheat. 5. Vegan Meat Replacements are typically made with wheat gluten. Choosing a Vegan gluten-free lifestyle means being very careful of your product choices. 6. Sushi Soy sauce in the dipping sauce is obvious, but much sushi uses some soy in the seasoning of the individual pieces as they are being made. If inexpensive sushi is made from faux crab or fish, that is also gluten-rich. 7. Rice Crispies – Yes there are gluten-free rice crispies, but the ones used to make the pre-made treats or used in bakeries to give a bit of a crunch to cookies or pastry are not that kind of rice crispies. 8. Tortillas – Corn tortillas are naturally gluten-free, but many restaurants use the newer wheat and corn blends or fry their chips in a fryer that is also used for battered items, contaminating the chips with gluten. 9. Chocolates and Candies – Flavorings, rice crispies (puffed rice), and sweeteners can all contain gluten. Also, watch for malt powders. 10. French Fries – Although you would expect French fries to be just potatoes and oil, many have a flour coating to make them crisper or to allow spices to stick. The other concern is the dreaded cross-contaminated fryer, used to fry battered foods as well, leaving tiny bits of wheat dough all over your fries. Make them yourself at home. I review and discuss many of the gluten-free brands I enjoy on my blog. One of my favorite brands is Bob’s Red Mill, especially because of their dedicated gluten-free facility. I use their gluten-free oats exclusively for this wonderful crumble. 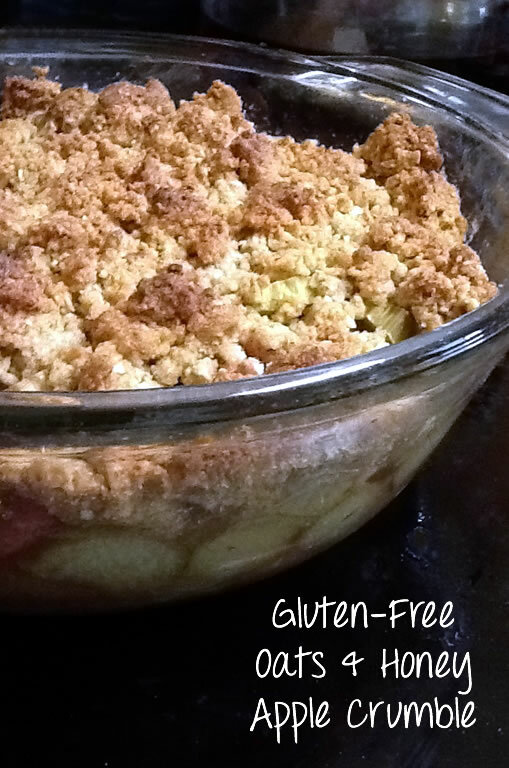 The oatmeal topping marries well with the apples, while being lightly sweetened with honey. With only the bare minimum amount of ingredients that are needed, you will find yourself with a mouth watering dessert that with spread its aroma throughout the house. Grease a deep casserole dish. Stir together the apples, vanilla extract, and ½ teaspoon cinnamon, and pile the apples into the casserole dish. In a separate bowl, mix together the oats, butter, honey, pecans, and remaining 1 teaspoon cinnamon. Spread the topping mixture on top of the apples. Bake for 40-45 minutes, until browned and the apples are soft. 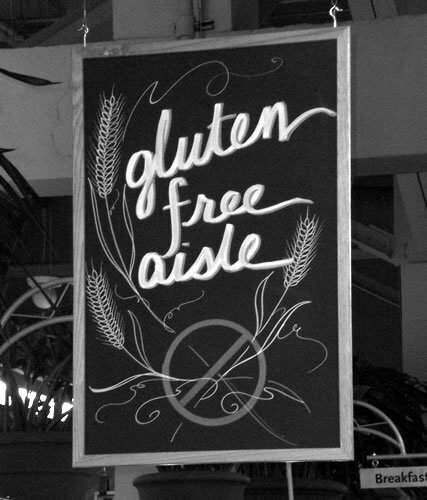 Photo: “Gluten Free Aisle” © 2007 by Alexis O’Toole, used under Creative Commons License. Dr. Jean Layton, is the Gluten-Free Doctor. Her background as a chef in New York combines with her medical knowledge to teach her patients how to thrive gluten-free. As co-author of Gluten-Free Baking for Dummies, she simplifies the challenges of baking in a whole new way. Connect with her on Twitter, Facebook, Instagram, and Google Plus. Actually all grains do have gluten. The fact that we are told that wheat, rye and barley are the only ones is wrong. If people are celiac they can react to products that are distilled grains which could contain wheat so it really depends on each person if they use these products. Very informative and such important info – thanks, Jean! I’ve never suffered from gluten issues or wheat allergies and have a hard time understanding why going gluten-free has become so overwhelmingly popular. I imagine that most of the population can tolerate gluten yet chooses to take on this fad because people think it will help them lose weight or they buy the marketing hype. I love making old-fashioned breads with wheat, rye and yeast, as well as making other baked goods that contain gluten. I’m sure there are some great substitutes and in order to reach those who want to avoid gluten for whatever reason, I will probably try out some gluten-free recipes to see how they turn out. However, I’m really puzzled at the reasons why gluten has become the new pariah in the food world. If you have a good answer for me, please do let me know! We tried a gluten-elimination diet to see if that was what was causing my husband’s digestive problems, and discovered that sorghum, oat flour, etc., can make really tasty cookies, pizza crust, and crackers. (Sandwich bread is really difficult!!) We just *like* some of the “alternative” flours now. And a little extra variety probably doesn’t hurt! Gluten-Free became popular in the media because famous folks like Elizabeth Hasslebeck wrote books, or athletes like Novak Djokovic improved their games. That awareness highlighted an underlying cause of people’s distress. Add that to the explosion of research about celiac disease and gluten intolerance, and you get a new component in Doctor’s diagnostic algorithm. Finally folks who had symptoms for years could ask for celiac testing, research for themselves about why they had symptoms. The incidental fact of a weight loss when people removed an irritant from their food certainly didn’t hurt either. I disagree here only that Elizabeth Hasslebeck is famous! People jumped on this bandwagon because they thought they could lose weight. Naturally, if you give up doughnuts, bagels, and lots of bread, you will definitely lose weight! It’s just another fad, and a huge money maker for big industry! I agree that Elizabeth Hasselbeck isn’t necessarily famous but her book certainly was.